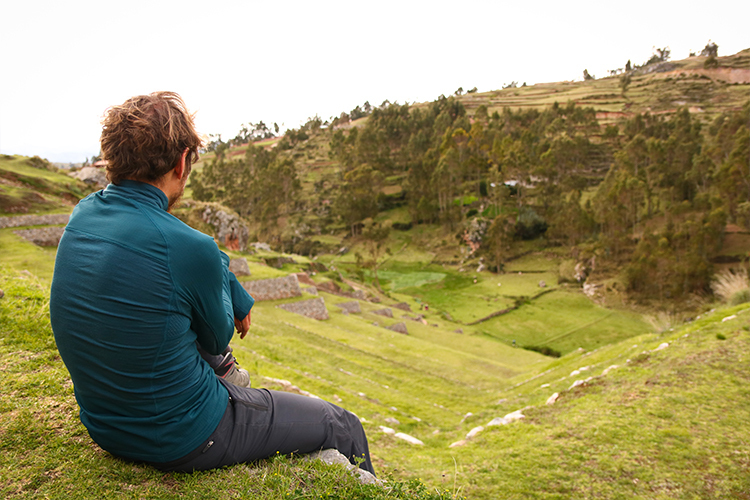 After a quite night in the small village of Limatambo, it’s time to meet the Inca civilizations and their secrets. 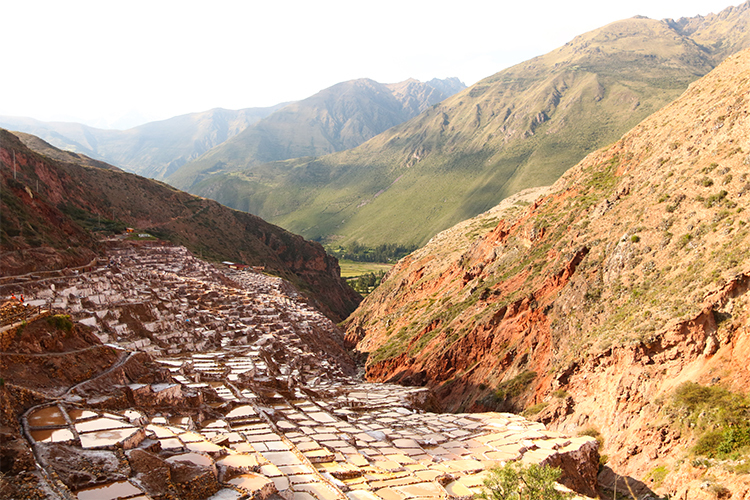 Our entry in the Sacred Valley will be by the Maras village. In spite of our wish to opt for the road, it’s by path that we will reach this pretty village due to some roadworks After a generous “almuerzo”, we go towards the famous Salinas, just a few kilometres away further down the village. Built by the Incas, the 3600 ponds are still used today to harvest salt. This white gold is coming from a source of salt water imprisoned in the adjacent mountain. It releases a small stream providing water to each pond. We continue our journey by a stop in Ollantaytambo. This charming village, being similar to villages in the French Alpes, is today highly frequented by tourists due to its strategic location being at the gates of the Machu Picchu’s Valley. In the past, Inca made this city one of their main military bastions to defend the entry of the valley. We can still visit the remains. The next day, at dawn, we are going on the main square of the village, hoping we will find a bus to reach the hydroelectric central of Santa Teresa. Then, the aim would be to walk to Aguas Calientes, the village at the bottom of the Machu Picchu as it’s impossible to reach the village by vehicles (except by train). It was not easy to negotiate four seats at a good price to reach our destination. After waiting and negotiating during two hours, we are finally on the road to the hydroelectric central in a mini-bus shared with a classroom of high-school students from Puno in Peru. The road to Santa Teresa is winding but very nice. Plus, the students are creating a good atmosphere in the mini-bus. 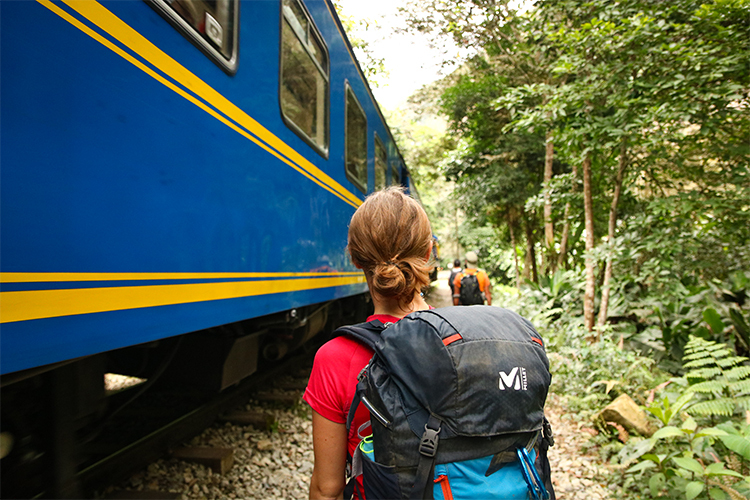 Once arrived at destination, we start the small hike alongside the rails of Perurail. 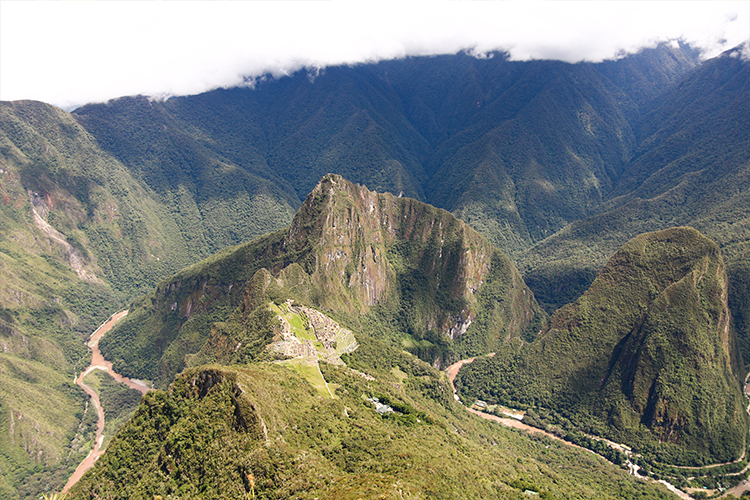 When looking up, we can see for the first time the Machu Picchu perched at the top of a mountain. After a 2-hour walk, we reach the Aguas Calientes village also named the Machu Picchu village. At this highly touristic Peruvian village, we can find hotels and restaurants at higher prices than usually. After going around in the small streets, we finally find a room and burgers at acceptable prices. After a short sleep, the alarm rings at 5am. We can’t resist for a breakfast at the French bakery in the village. Nothing better than a pain au chocolat to start a hiking day. Straight after, we start the climb to reach the entry of the Machu Picchu.m ; a 5-km hike with 1,500 steps. Once arrived at the site, the game is to find the perfect spot for an unusual photo and away from the tourists. 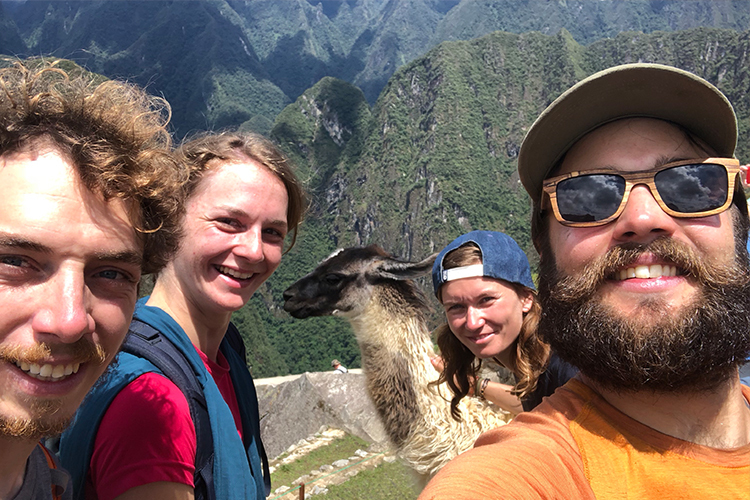 After getting friendly with a llama for a selfie, we climb the mountain of the Machu Picchu and its 2,000 steps over a 550-metre. After this physical effort, we are well rewarded. Clouds are going away and the sunshine reveals a breath-taking view over the archeological site with the mountain of the Huayna Picchu in the background. After seven hours spent between the temples and the vestiges of the Incas city we are going back down to Aguas Calientes to grab the Inca-Rail which will bring us back to Ollantaytambo where our side-cars are waiting for us. On the way to Cusco, we continue the discovery of the Sacred Valley by visiting the archeological sites of Moray and Chinchero. 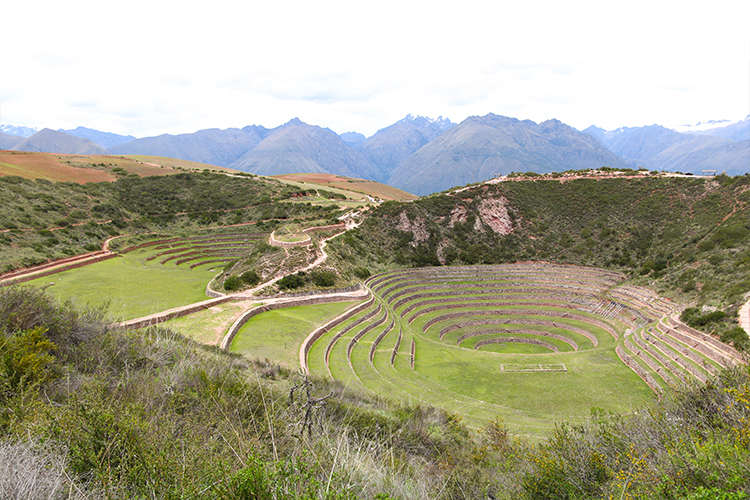 The first is a site where the Incas did agri-food experiences. Its architecture is made of several circles used to grow plants and study their water needs. Therefore, with this architecture, the circle in the middle had a better irrigation than the higher terrace. This part of the travel is ending with the visit of the Cusco city. There is a unique ambiance where we can feel a strong energy that locals call “la energia indigena”. This atmosphere is particularly present in the covered market in San Pedro where there is perpetually an effervescence. The white walls with coloured balconies, the religious buildings and all the buildings with a colonial architecture increase the travellers’ appeal to visit the city. Perched on the top on the city, the impressive archaeological site named Sacsayhuaman is closing this sacred part with the secrets of the Inca civilisation. Not that easy to find a place to dine, nice and at a good price in this highly touristic Peruvian city. After long minutes of researches, we found the rare gem. 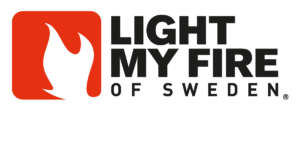 This restaurant has a burger menu with appropriate prices and great taste, all of this accompanied with an enjoyable decoration and playlist. For a Peruvian breakfast, there is nothing better than going to the market to find a sandwich with egg-cheese-avocado served with a fruit juice. The day begins at his best, without spending too much. In the Ollantaytambo village, there is no exception. We are going up at the second floor of the covered market to find what we are looking for. This small shop offers a pretty terrace with three or four table. To reach it, you need to climb up a few steps behind the Plaza Mayor. The bar located on the heights of the city offers a breaking view over Cusco. We recommend you to enjoy a Cusqueña beer at the sunset time. Trigo, Dorada or negra, the shop has all the recipes.